I love eggrolls: Chinese eggrolls, Vietnamese eggrolls (Cha Gio), Filipino eggrolls (Lumpia), but knowing that they’re deep fried, I don’t eat them as often as I’d like to. I have to say that the baked eggrolls were a huge success: golden brown and crunchy, dipped in sweet chili sauce and/or hot mustard – guilt-free, nutritious, and delicious! 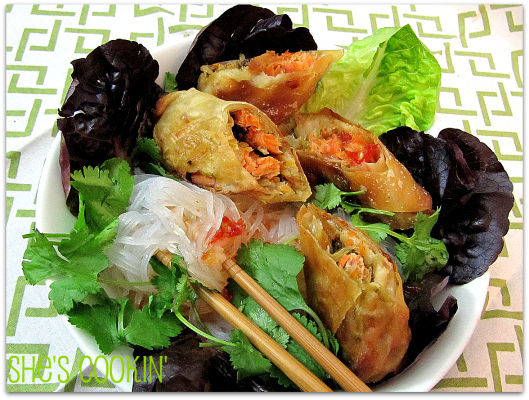 I devoured these salmon eggrolls for two days: first, in their pure, unaltered state of eggroll and, on the second day, in a Vietnamese-style bowl of vermicelli, tender lettuce leaves, cilantro and sweet chili sauce. 1. Heat grill to med-high heat. Rinse salmon filet, pat dry with a paper towel. Spread with teriyaki sauce. Grill for about 5 minutes, skin side down. One way to tell the fish is done enough is when a white substance (fat) begins to appear on the flesh, another way is if the fish flakes under gentle pressure from the spatula. Do not overcook, the fish should still be moist. It’s better to undercook – it will be baked inside the eggroll, too. Remove from grill with a fish spatula. Set aside to cool. 2. Meanwhile, heat a skillet with the peanut oil, sesame oil, and a sprinkle of red pepper flakes over med-high heat. Add the onions, saute for a minute, then add the broccoli slaw. Continue to cook for about 5 minutes until vegetables are softened. 3. Using a fork, gently press down on the salmon to flake off pieces. It should separate from the crisp skin very easily. Place the pieces of fish on top of the vegetables. You can also use pieces of crisp skin if you desire – if you like salmon skin roll sushi – this is how it gets it’s name and it’s terrific charred flavor! 4. Take one eggroll skin at a time and place a scoop of the mixture in the middle, spread out so the filling is about 2″ long by 1″ wide. Most eggroll skin packages contain a diagram of how to fold to get a perfect eggroll. You first fold one triangular end over the stuffing, then fold in the two sides, use your fingers to compact the stuffing, roll up, lightly brush the end with water to seal. 5. Line a cookie sheet with parchment paper. Place the eggrolls seam side down on the parchment, spray with canola oil and bake for 20 minutes. Turn the eggrolls and bake for 10 more minutes or until golden brown and crispy. If you miss the blistered skin of a fried egg roll, you can certainly opt to deep fry these. You can also substitute shrimp, pork, chicken or tofu for the salmon, if you’re not as big of a salmon lover as I am. In fact I declared this “I ♥ Salmon Week” and kicked it off with Salmon with Bow Tie Pasta and Peas on Monday. What’s your favorite salmon preparation? 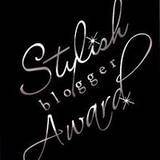 I’d like to dedicate this to Raven at Ravie NomNoms who honored me with a “Stylish Blogger Award” and is also a big salmon lover! Thanks, Raven! Wandering Chopsticks’ Vietnamese Cha Gio eggroll recipe. Burnt Lumpia’s Filipino lumpia recipe. Those look so delicious! I love the addition of salmon! @Mary – Thank you 🙂 and thanks for visiting so I could find your blog, too. @Tanantha – Broiling works, too! That’s what I usually do if I can’t grill. This sounds terrific Priscilla! I always fry my egg rolls and only bake them to heat them up. I will have to try your way. It sounds much healthier. Hmm..I like raw salmon like sashimi and probably broil with spiced rub! I had a smile or laugh when i read “The Don ” 🙂 I like the recipe. I could appreciate the thought in not deep frying. These look fanstastic! The filling with the salmon sounds really tasty. I will have to try baking my spring rolls as I am not too hot about deep frying in my kitchen. Priscilla, this is fabulous! The main reason I don’t make lumpia often is because I don’t want to fry, I can’t wait to try this. Love how this paired with the noodles makes a perfect meal! II haven’t tried baked spring rolls yet. Im just curious how’s the texture? Is it still crispy? I love the idea of salmon spring rolls though. Sounds like a healthy alternative for a spring roll. I love rolls of all kind too…but I hate eating fried food. My stomach doesn’t take well to it (although it does taste pretty darn good!) I’m eager to give these rolls a try. Thank you for sharing such a tempting meal! I hope you are doing well. Stay warm and enjoy the end of your week! Priscilla, this looks scrumptious! 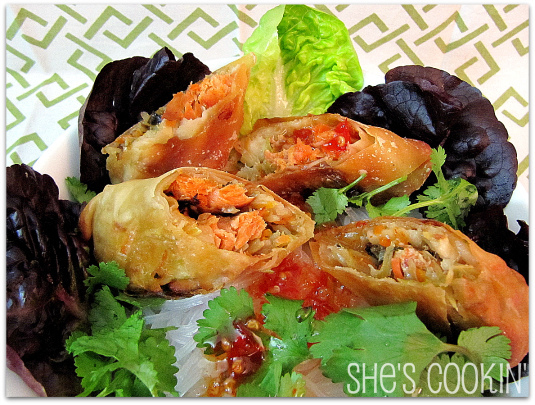 I love spring rolls, but never had one with salmon filling…can’t wait to try! I try to stay away from fried foods – so I am darm glad you posted such a yummy looking alternative to an old favorite. These are a must try! I see I’m not alone in my love for egg rolls and distaste for fried foods! @Biren – I’m not hot on frying either – smells up the entire house! @Malou – They were crispy enough for me! Plus, a lot less greasy! Oh myyy..those are so amazing…Love the colors and how tasty it looks! Thanks for sharing this piece of art! Well done on the award and for these egg rolls. Perfection on a plate with such lovely colours and balance of texture. Just mouthwatering! Oh goodness! I’ve just recently started to make my own egg rolls and am still playing with all of the flavor possibilities. I would have never thought of salmon though! These look absolutely delicious. This looks awesome! I have never made egg rolls, but I do love the idea of baking instead of frying. I’ve been feeling really guilty lately about some of my unhealthy choices, and have some plans of eating unhealthy things this weekend (yeah, I know, I’m bad, haha), but this would be a refreshing change 🙂 Thanks for sharing. 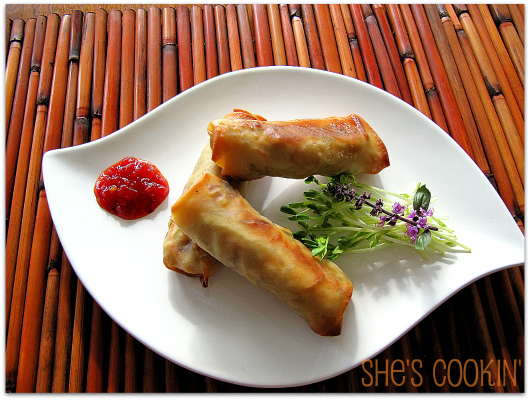 I love, love the idea of baking egg rolls…yours did not lose a thing except calories! YUM! I love that these are baked and the Sockeye Salmon filling sounds excellent! I like how it’s baked, so much healthier! These sound so good and light! Fantastic job. Looks and sounds wonderful. Priscilla- These look SO good! Love that they are baked rather than fried. Absolutely perfect. Congrats on today’s Top 9 – well deserved!! I was just thinking that I should look for a baked eggroll recipe. These look delicious, and I love that they are made with salmon and broccoli. Yum! Baking is better than deep frying. Looks yummy!